All through October, Alphabet Soup is celebrating turning three. 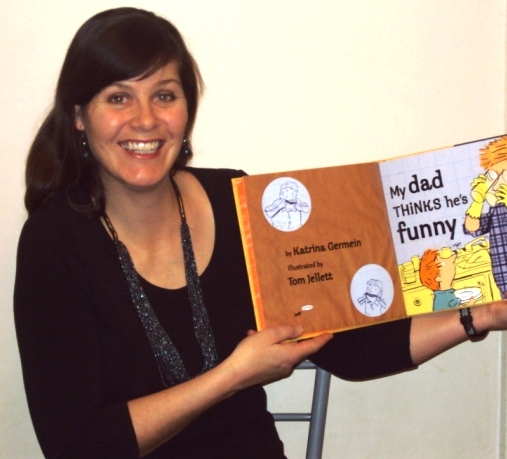 We have heaps of writers and illustrators stopping by to answer THREE QUICK QUESTIONS and today’s visitor is Katrina Germein, author of Big Rain Coming and My Dad Thinks He’s Funny. I’m not picky. I’ll draft anywhere—on a bus, in a park, beside the sea. I love notebooks with fancy covers and keep a store in my car and my handbag for when I find a few minutes to scribble ideas. When it comes to sustained writing and editing I like to work at a desk with my computer. It doesn’t need to be my desk and it doesn’t need to be very big but it needs to be in a quiet place. I’m not one of those authors who can work with music playing. 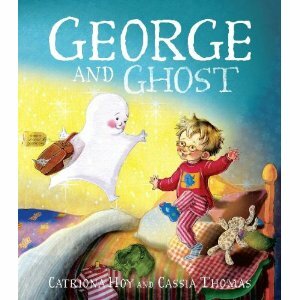 George and Ghost by Catriona Hoy and Cassia Thomas. It’s beautiful. I love all of Catriona Hoy’s picture books. I’d love to have written them myself! 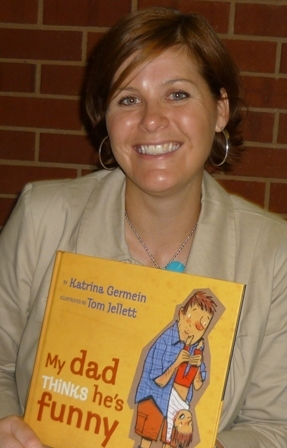 Find out more about Katrina Germein and her books—visit her website and her blog. The auction ends 24 January 2011. 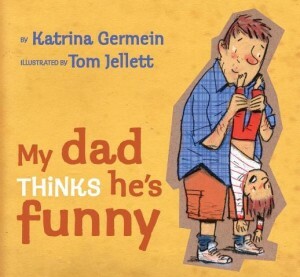 Katrina Germein is celebrating her new book My Dad Thinks He's Funny. My dad doesn’t like babysitting. He says no one should sit on babies. My dad doesn’t eat seafood. He says there’s something fishy about it. My dad doesn’t lie in bed. He says you should always tell the truth. My dad thinks he’s funny. Congratulations on your new book, Katrina! When you were growing up, did your dad make all the jokes in My Dad Thinks He’s Funny? A peek inside the book! I’m lucky because I grew up with two dads, my father and my step father. My dad likes to tell long stories and my step dad likes to recite silly poems. Mainly, the jokes in My Dad Thinks He’s Funny came from lots of other people. Once I had the idea for the book I started listening out for jokes and every time I heard one I would write it down. My father-in-law probably contributed the most but there are also jokes from my sister-in-law, my brother and my husband. I was looking for the kind of jokes that make us roll our eyes and also make us laugh. Once I had a collection of ‘dadisms’ I decided to write the book from the point of view of a child. I wanted to create a story that was warm and humorous, rather than just a collection of jokes. What does your family think about you using their best jokes in your book? I think my father-in-law is quite proud to see some of his best material in print! He jokes that I should share the royalties from the book with him. Now you have your own kids—do they hear these jokes from their dad (or your dad or stepdad)? Yes! Unfortunately it runs in the family and my husband tells jokes just like his dad. What’s your favourite joke from the book? My favourite page is the one where the little boy asks, “Dad, do you know what?” and Dad answers, “I don’t know What, but I know his brother.” That makes me laugh every time. It’s one of the hardest jokes for very small kids to understand but children who are seven or over really like it. Usually I just laugh. I actually think they’re funny! 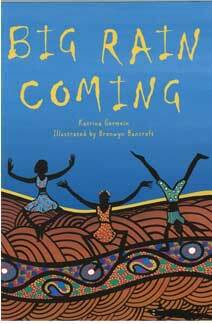 Katrina Germein is the author of many children’s books, including My Dad Thinks He’s Funny, Little Dog and Big Rain Coming. You can find out more about Katrina Germein and her books by visiting her website, her blog, Twitter, and her Facebook page. Today Katrina Germein visits Soup Blog to share about ‘lights out’ (or rather, ON) at her house. 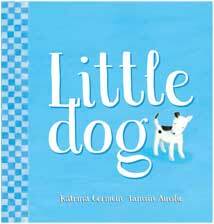 Katrina is the author of Big Rain Coming, and Littledog, and she has a new book coming out in August – My Dad Thinks He’s Funny. My son thinks he can trick me. He thinks he has me fooled. But I’m smarter than he thinks and I know what he’s up to. He tells me he wants to sleep with the light on, not just the lamp but the big bedroom light. I don’t believe him; no one sleeps better with the big light on. Still, I leave the light. I know it’s all part of his sneaky plan. “Shut the door,” says my son when I kiss him goodnight. “But you get frightened,” I say. I close the door and leave him alone, alone in his room with the big light on. But he’s not alone really; he’s invited others. They’re all in it together. I wonder who’s conspiring with my son tonight. Zac Power? The BFG? Specky Magee? Bonnie and Sam? Captain Underpants? My son has his favourites. (If it was me I’d choose Pippi Longstocking. But this is my son’s sneaky plan and not mine.) Anyway, I’ll find out who the accomplice is later. I have my ways. An hour later I open the door. My son is asleep, The Famous Five still in his hand. So that’s who’s been plotting with my son tonight. He’s not the first to fall for their charms. I kiss my son on top of his head. “Good plan,” I whisper and I turn out the light. 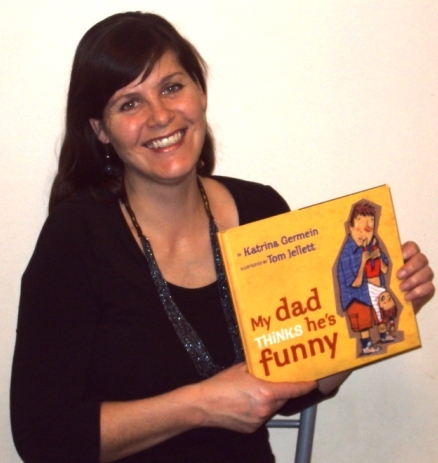 You can find out more about Katrina Germein and her books at her website. Alphabet Soup magazine is celebrating the launch of Undercover Readers (our new reviewers club for kids)! If you’d like to join the Undercover Readers Club, you’ll find an information pack you can download from the Alphabet Soup website. As part of the celebrations, we have a different children’s author or illustrator visiting Soup Blog each day until 29 June 2010 to talk about what they used to read after ‘lights out’ when they were growing up. So be sure to check back tomorrow! Have you heard about the 2010 Max Fatchen Literary Awards? It’s a poetry competition for South Australian school students. Entries close 30 July 2010, and first prize in each category is $50! The poems will be judged by Australian writer, Katrina Germein. Visit her website for more information.